Babylonian scholar of the fifth century; the junior of Mar Zuṭra, who reports to Ashi a halakic objection raised by Ḥanina (Niddah 52a). It is said that at one time Ḥanina's mother had such an aversion for her husband that she would not live with him. Mar Zuṭra succeeded in bringing them together again; and Ḥanina was the offspring of the reunion (Ket. 63b). In the haggadic literature he does not appear, but in halakah he is quoted as an authority (Soṭah 25b; Ḳid. 79a). He endeavors to reconcile conflicting opinions of others (Ber. 52b; Shab. 23b; see Rabbinovicz, "Diḳduḳe Soferim," ad loc.). 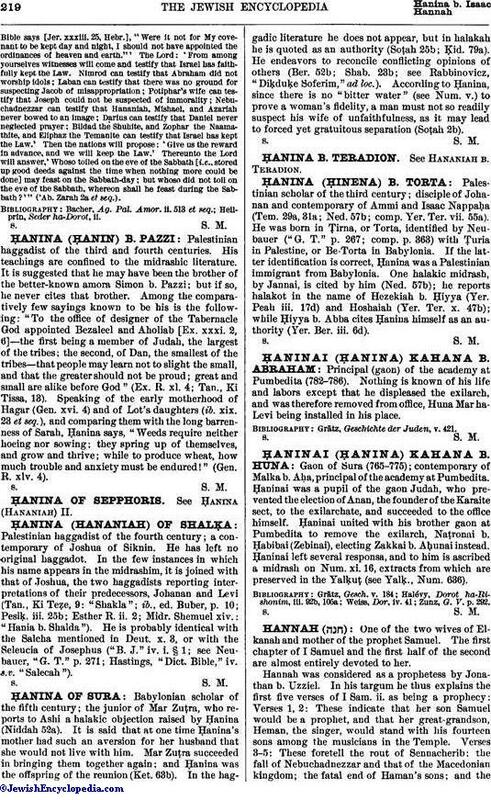 According to Ḥanina, since there is no "bitter water" (see Num. v.) to prove a woman's fidelity, a man must not so readily suspect his wife of unfaithfulness, as it may lead to forced yet gratuitous separation (Soṭah 2b).